One of the most important decisions facing a pet owner is when to make an End of Life Decision for our cat or dog. When is it time to talk to our veterinarian about humanely euthanizing a beloved pet? Our pets cannot make their wishes known to us or leave a Living Will. Animals cannot tell us how much pain they are in, how tired they are of all the treatments, how frustrating and embarrassing it is not to be able to take themselves outside on their own to go potty, or their quality of life is severely lacking and they just feel tired and sick, and wish they could just take a nice, long nap - forever. Human beings can leave instructions about their end of life decisions; appoint someone to make sure their wishes are honored by family members, officials, health care workers and hospitals. Through a Living Will people can make some decisions as to when to stop certain life-sustaining treatments, but how do we make that decision for our best pet pal? I grew up like many of you with the occasional dog or cat, but it was a family pet. I started having pets of my own in my mid 20's. In the mid- 1980's, I got my first German Shepherd dog and took her to obedience classes. Eventually, because she was so attuned to me, I entered her in a dog show in the obedience class which soon got me interested in the conformation side of showing. 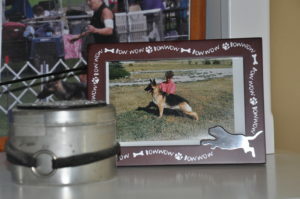 Showing my dog led to training, breeding and raising German Shepherd Dogs for almost 20 years. In 1991, I was involved in a roll-over car accident, lots of hospital time and two years of lost memories due to a severe closed head injury, learning to walk and talk again, and other issues that still persist all these years later. A few years after my accident late 1993, I noticed one of my older German Shepherd girls was having problems getting up and down and she was a bit slower getting around. I kept thinking, "When I see she is in pain, that's when I'll know". 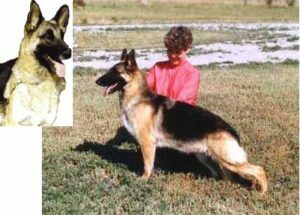 This particular German Shepherd female's registered name was Caprice Purrfect Kat and I called her "Purr" or "Purrbutt" (pictured to the right with her breeder, Margaret Isenhart). Purr was born on May 22, 1986 and she was one of the best dogs I have ever had, she wanted to take care of everyone; human or critter. Even though Purr was having a bit more difficulty getting around, her attitude was good (or so I thought). Purr loved a good joke. She used to "sneak" up behind me and "goose" me (nudge me with her muzzle) on my backside. After which, she would turn her head back over her shoulder and look at me and chatter her teeth like she was laughing. Great joke; she loved to do this over and over again! In June of 1995, the inevitable happened in a household of a female dogs, one is ALWAYS the alpha. Purr was my alpha female – the pack leader among all my other dogs. An alpha female makes the rules, which is how a dog pack co-exists. When an alpha gets sick enough / old enough, a younger female will challenge the alpha female for pack control. Eventually, one of the younger girls challenged Purr for alpha. Purr had a few bite wounds but nothing serious and I promptly took her to my vet. While in the exam room, she looked at me and gave me such a look; one I will never forget. I swear she was trying to tell me, "I am tired, I am old, and it is time". In addition, the vet told me, "Susan, I can patch her up and she will be fine, but it is going to happen again. She can no longer defend herself and this is the world of dogs. Additionally, she has a degenerative issue in her lower back, this condition will rapidly progress until she cannot get up at all." He said, "Look at her she is telling you she is ready; that she is in pain." I sat with Purr for a while thinking about what the vet told me, about Purr and our time together, her "goosing jokes", her stubbornness about not being TOLD to do something (you had to say "Purr please sit" and then she would obey) and all the numerous things we had shared together. Purr was resting her muzzle on her front feet, and she looked into my eyes and I realized she was REALLY tired and literally begging me to let her go. I know this will sound weird, but I believe with my whole heart Purr stuck around as long as she did because she knew I was not ready to let go because of everything I had lost after my car wreck. Purr helped me during the years after the car accident, by being my constant companion, establishing serenity out of my chaotic brain, and helping with the other dogs and puppies. That day in the vet's office (June 19, 1995), I realized I had not made an End of Life Decision regarding Purr because of my own selfish reasons – I was not READY to let her go. Being selfish, to me, is completely contrary to our bond with our pet, always keeping their best interests first and foremost in our mind. My decision was made. The vet came back in and gave Purr an injection to euthanize her. I removed Purr's collar and held her until she was gone. I then wrapped her in blanket so she would not be cold. (A blanket? You think weird things at these times.) I had Purr cremated and when I got her cremains home, I wrapped her collar around her urn and placed it next to a picture of her (picture was taken at about three years old) - they have never been separated. Purr has moved with me through four new homes since she passed. This was my way of making a very personal decision and one I've found I can live with without feeling guilt or second guessing or making myself crazy with the shouldas, couldas, wouldas, – my criteria for the end of life decision became "Am I keeping this pet with me because I am not ready to let go?" If the answer is that I am not ready to let go despite signs of obvious pain, suffering, non-recoverable illness or disease, then I am being selfish. I feel I owe it to that pet to let it go with dignity after every good thing it did for me: loyalty, snuggles, funny faces, funny poses, seeing imaginary things flying in the air, crawling under the bed covers to stay warm, and so much more. All the 101 things they do for us – the people they love. What is in the bests interests of my pet? Am I keeping my cat or dog alive because I am the one not ready to let go? What is my veterinarian advising? What is the prognosis of the pet? Is the pet in pain and how much? What is my pet's quality of life? If I do not make a decision, will the dog or cat suffer more or have a horrible death? Your answers will guide you to having a conversation with your veterinarian on the best course of action. In my opinion, the best time to address an End of Life Decision is well in advance of a pet's illness or old age so you do not feel rushed into a decision. When will you know with certainty? All one can do is think about the above questions. As a pet owner you know your dog or cat better than anyone. You will know when it is time and it will be a time that will work for you both. No one outside the situation has the right to criticize your decision, second-guess your decision, or otherwise stick their nose in it. Your decision is yours to make and one that is not ever entered into lightly. Remember, you gave your dog or cat a perfect life, because they had you! And, at the end you were their best buddy again, because you had the strength to let them go and cross Over the Rainbow Bridge where sometime in the future you both will be reunited.